Whether your child is behind in math or learning beyond their grade level, chances are they could improve their math competency this school year. Here are a few study tips for a brand new school year of math! Create a list of improvement goals for the upcoming year. Talk with your child’s math teacher and determine the areas they should improve on in the New Year. Identify which standardized tests are on the horizon so that your child has time to prepare. Schedule a comprehensive written and verbal assessment at your local Mathnasium Learning Center. Our assessment will pinpoint your child's learning needs, and our team will develop a customized learning plan with your child's goals in mind. Once you’ve figured out which areas your child needs to focus study time on, it’s time to attack! Come up with a study plan that will address the needs of your child with input from them, their teacher, and your local Mathnasium Learning Center. Don’t focus on too many things at once. Make sure core competencies are addressed before skipping ahead to new topics. Your local Mathnasium team can provide guidance following your child’s assessment and implement a customized learning plan that will fill in any gaps and ensure a strong foundation of math knowledge. It’s hard to improve in any subject when negativity clouds your experiences. 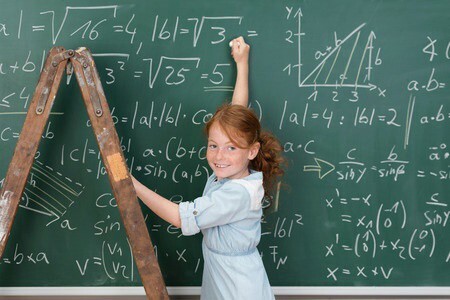 Make sure your child keeps a positive attitude toward math. Don’t focus on past negative experiences. That last test grade was a bust? Figure out where your child went wrong, discuss it with them, then move on. Celebrate achievements and progress. When that first improved homework grade comes in, make sure they know how proud you are! With improvement and understanding comes confidence. It won’t be long before your child is looking forward to their math sessions! Math success is heavily influenced by what happens outside the classroom. Make sure your child is setting aside enough time to focus on homework and math practice. Let them know math success is a big priority by being involved in their homework and home study time. Schedule frequent sessions at your local Mathnasium Learning Center so that your child is on track and getting ahead. Math can and should be fun! At Mathnasium, we use proprietary curriculum that ensures math learning is lighthearted and fun as well as thorough. You can also find ways of incorporating math into your home life so your child can practice their math skills while doing fun activities such as shopping, cooking, sports, etc. Stay tuned on the Number Sense blog for more fun ways to practice math at home!